Below is a summary of each of the previous planning efforts. Published executive summaries and/or summary presentations of each, with the exception of the 1990 Plan, are available for viewing online and printing. These previous planning documents are provided for informational and historical purposes only. Please refer to Mobility 2040 for the currently approved plan recommendations. Mobility 2035 - 2014 Amendment was adopted by the Regional Transportation Council of the North Central Texas Council of Governments on November 13, 2014. The 2014 Amendment built on previous planning efforts and was necessary to move critical projects towards implementation. The 2014 Amendment was developed with substantial public input and collaboration with regional transportation partners. Mobility 2035 - 2013 Update was adopted by the Regional Transportation Council of the North Central Texas Council of Governments on June 13, 2013. The 2013 Update was the result of continuous and cooperative planning efforts. This update allowed critical transportation improvements to move towards implementation. The Mobility 2035 – 2013 Update received a favorable air quality conformity determination from the US Department of Transportation on July 19, 2013. Mobility 2035 was adopted by the Regional Transportation Council of the North Central Texas Council of Governments on March 10, 2011. Due to a reduction in anticipated revenue, Mobility 2035 represented a significant shift in the way the region planned for transportation improvements. Mobility 2035 saw the deferral of over $45 billion in transportation improvements from previous planning efforts. Mobility 2035 sought to maximize the existing transportation system, implement programs to change travel behavior, and to strategically invest in infrastructure. Mobility 2030 - 2009 Amendment was adopted on April 9, 2009 by the Regional Transportation Council of the North Central Texas Council of Governments. The 2009 Plan Amendment was the result of a continual and cooperative planning process, and incorporated administrative amendments to allow planning, engineering, and construction elements to continue for several regional projects. Following the initial adoption of the 2009 Plan Amendment, the region’s Metropolitan Planning Area was expanded to cover 12 full counties in North Central Texas. As a result of this expansion, the 2009 Plan Amendment was revised to include the new MPA expanded boundary, and on October 8, 2009, the Regional Transportation Council adopted a revised plan that covered the new 12-county planning area. Mobility 2030 was adopted on January 11, 2007 by the Regional Transportation Council of the North Central Texas Council of Governments. A favorable air quality conformity was received on June 12, 2007. Mobility 2030 incorporated concepts from the Safe, Accountable, Flexible, Efficient Transportation Equity Act: A Legacy for Users (SAFETEA-LU). A resolution certifying Mobility 2030 met newly enacted SAFETEA-LU planning requirements was adopted by the Regional Transportation Council on January 24, 2008. Mobility 2025 - Amended April 2005 was adopted on April 14, 2005 by the Regional Transportation Council of the North Central Texas Council of Governments. A favorable air quality conformity determination was received on June 16, 2005. The 2005 Plan Amendment was the result of continued cooperation between elected officials, community leaders, transportation providers, planners, and engineers. Mobility 2025 - 2004 Update was adopted on January 8, 2004 by the Regional Transportation Council of the North Central Texas Council of Governments. A favorable air quality conformity determination was received on April 8, 2004. Mobility 2025 Update was adopted on May 10, 2001 by the Regional Transportation Council of the North Central Texas Council of Governments (NCTCOG) and on May 24, 2001, by NCTCOG’s Executive Board. Mobility 2025 was adopted in January 2000 and incorporated the ideas contained in the Transportation Equity Act for the 21st Century. Mobility 2025 was a broad-based, multimodal plan incorporating the concept of sustainable development, the interrelationship between land use and transportation system performance. It also incorporates the latest concepts known from the ongoing and completed major investment studies and environmental studies. Mobility 2020 was adopted in December 1996 and furthered the ideas in the Intermodal Surface Transportation Efficiency Act of 1991. This plan provided additional detail on the congestion management portion of the plan and introduced the notion of “Quality of Life” considerations aimed at integrating transportation systems into communities and minimizing their negative impacts. 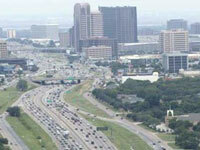 For the first time, the locally preferred alternative (LPA) from the LBJ (IH 635) Major Investment Study was included. This LPA was the result of the consensus-building process between the transportation providers, local governments, and the community. Also included was an aggressive financial plan, which outlined the expected revenue shortfall of the plan and ways to reduce the shortfall. Mobility 2010 Update was developed in 1993 in response to the planning requirements set forth in the Intermodal Surface Transportation Efficiency Act of 1991. The plan included a federally required Congestion Management System; bicycle, pedestrian, and other transportation enhancements; HOV and express lanes; regional rail and bus transit system improvements; and freeway and thoroughfare improvements. The $15.2 billion plan had to be evaluated for conformity with federal air quality regulations, and also had to identify available resources for implementation. Mobility 2010 completed in 1990, was a 20-year plan that listed improvements in four major categories: freeway improvements; rail and general transit service improvements; HOV lanes; and strategic regional arterials. One goal of the plan was to identify roadway and transit improvements in the year 2010 which would provide levels of service and mobility equal to what was experienced in the region in 1980, based on annual delay per capita. The plan included an evaluation of the air quality impacts of the plan. This was done to ensure that implementation of Mobility 2010 would not result in increased non-methane hydrocarbon emissions, a requirement of the Clean Air Act. Mobility 2000 was completed in 1986. Adoption of the plan capped an 18-month process of evaluation and analysis guided by the Regional Transportation Council. The plan included HOV facilities for preferential use by carpools, vanpools and buses, and a passenger rail transit system (passenger service on Dallas Area Rapid Transit's electric light rail system was initiated in June 1996). The plan also made recommendations for new and improved freeways and parkways, and arterial streets. The Total Transportation Plan for the North Texas Region for 1990 was the first regional transportation plan for the Dallas-Fort Worth Metropolitan Area. In developing the plan, year 1990 population and employment forecasts were used to project travel behavior on highway and transit alternatives. The planning process also included the evaluation of air transportation system concepts, and the inclusion of selected ground and air transportation alternatives in the completed plan. Recommendations of the 1990 Plan included: a dual runway concept for what was to become Dallas-Fort Worth International Airport; a feasibility study for an east-west transitway or other right-of-way through the Mid-Cities area (the Trinity Railway Express commuter rail service began operations in a portion of the RAILTRAN corridor in 1996); a review to include the cities of Denton and McKinney, and perhaps all of Denton and Collin counties in the Metropolitan Planning Area (which are now included); the construction of several highways now completed or under construction (SH 360, SH 121 north of SH 183, SH 190, now the President George Bush Turnpike, IH 635 west of IH 35E and the Dallas North Tollway north of IH 635); and the implementation of express bus and carpool transitways on radial corridors in both Dallas and Fort Worth HOV lanes are now operating on the East R.L. Thorton Freeway (IH 30), the Stemmons Freeway (IH 35E), LBJ Freeway (IH 635), South R.L. Thornton Freeway (IH 35E) and US 67).